I've been trying to get a "Field of Dreams" shot of a cornfield around here, (it's as high as an elephant's eye) but ended up with more of a "Wizard of Oz" look. If I get the perfect "is this heaven?" golden waving fronds etc. I'll post again! But I noticed something funny, since the movie was on for the hundred-and-twenty-seventh time again last night: in FIeld of Dreams, there are no weeds between the rows, which are planted far enough apart that Shoeless Joe can walk through quite easily - not the case with corn around here! Nice black and white photo...I like it! Field of Dreams - a very popular American film, ca. 1988. 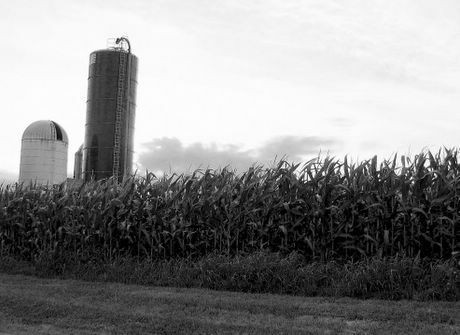 A farmer (played by Kevin Costner) in Iowa hears mysterious voices telling him "if you build it, he will come," and "go the distance." He decides hehas to build a baseball field where his corn once grew, and Shoeless Joe Jackson and the other disgraced members of the 1920-something Chicago "blacksocks" come and play there. As does his dad, and they get to have an emotional game of catch which heals all wounds. The most famous line in the moview is when Joe asks the guy: "Is this Heaven?" and he answers, "no, it's Iowa." "The corn is as high as an elephant's eye" is from the Rogers and Hammerstein musical "Oklahoma." Why black and white? Becuase it didn't look very good in color so I was trying various things to improve it. Didn't work.